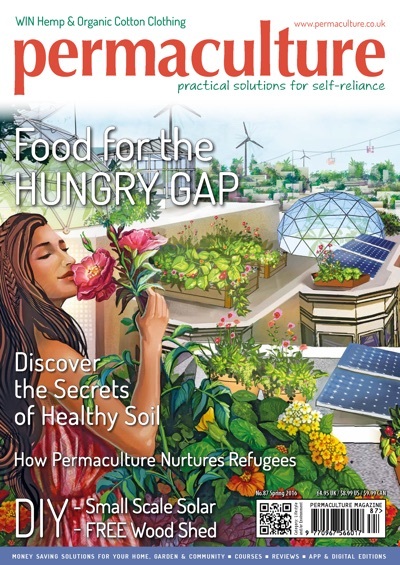 I just thought I’d share with you that I just signed up for over 20 years of current and back issues access through Permaculture Magazine. It seems a great offer, it was only 12 pounds sterling for the year. I like it because I can use the search function to easily search through all of the back issues for a keyword. And if you have a smart device such as an iPod or iPhone or android you can easily read through the issues on their app. It’s free to access some issues and also loads of information on their blog, and podcasts here. Here’s the link should you like to check it out. For health reasons, I normally try not to eat too many soy products. However I had a bag of dried organic soy beans sitting in my cupboard so I decided to do something with them. 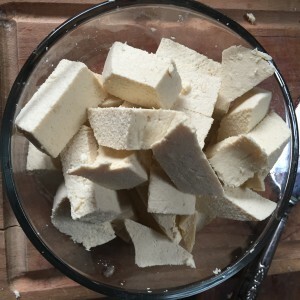 My dear friend Patricia Quinn had written in her book about how easy it was to make homemade tofu, so I decided to give it a go. I enjoy tofu from time to time but until making it myself I was never such a fan. This has all changed now and I shall make tofu more often after tasting how amazing it is fresh from the press. Well worth the work, and most of the time spent was actually just letting it soak and then after, letting it strain. 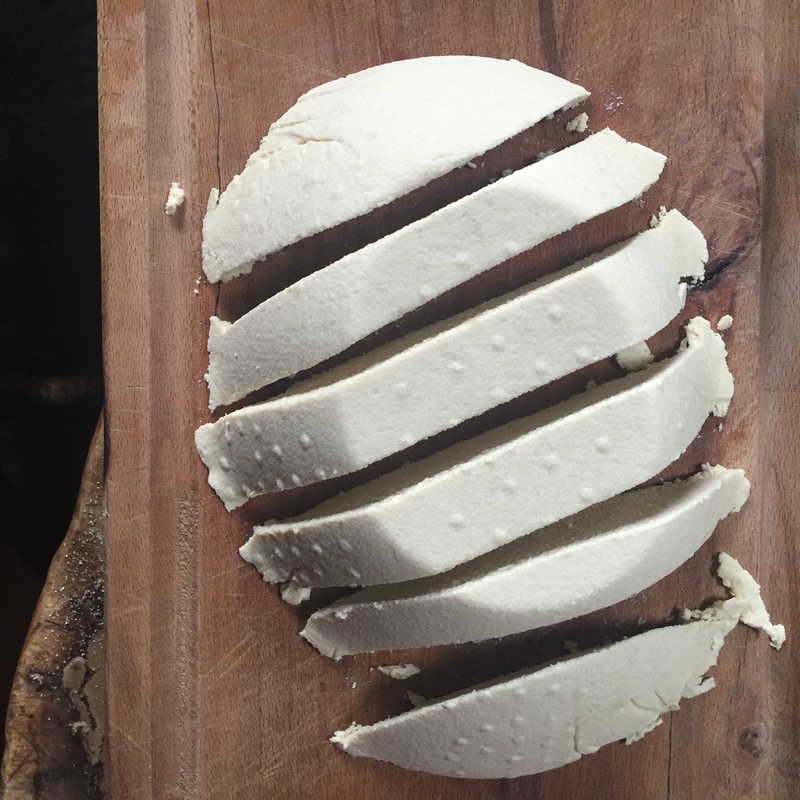 Ever wondered how to make homemade tofu? I took photos of the process and I’ll try to explain clearly here. First I soaked the beans overnight in water. They expanded to double their size. 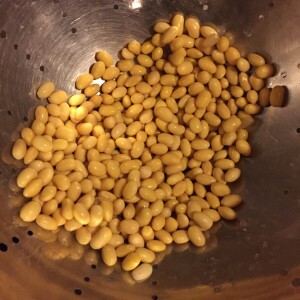 I used dried organic soy beans. I strained them the next morning. 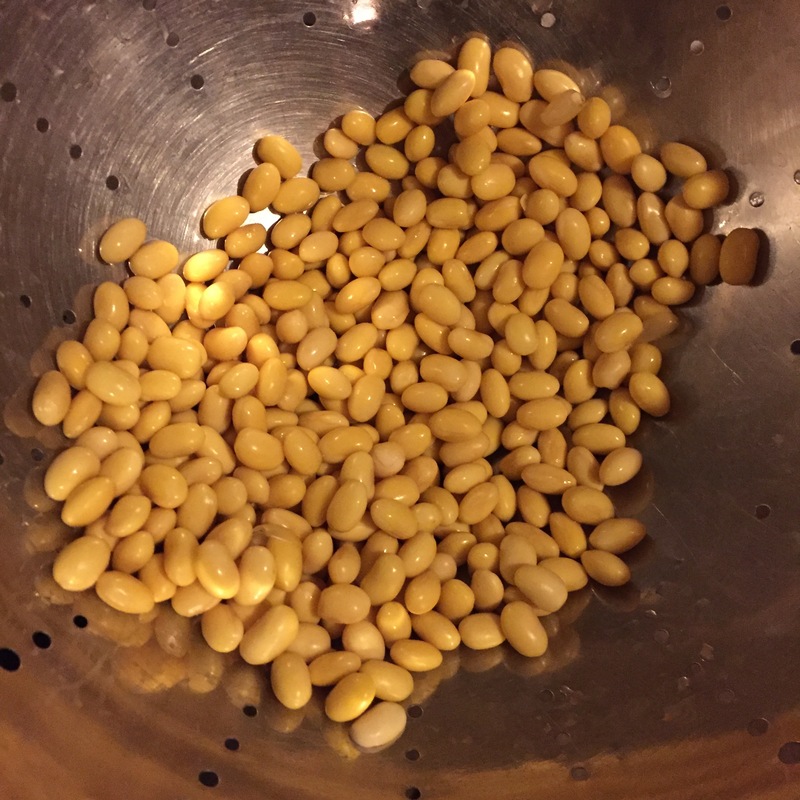 I made soy milk by blending and then boiling the beans in fresh water and bringing it to a boil. 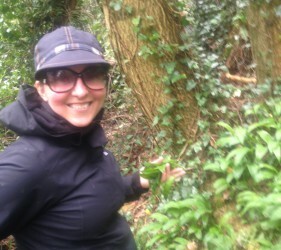 Actually, thats a lie- this is what you can do though, its not hard! I actually cheated and used the SoyaBella which made the soy milk for me in about 15 minutes. An unnecessary but handy tool. A gift from the other half many christmas’ ago and something I have put to good use. You can use it to grind herbs, coffee beans, nuts or to make your own flour from grains. It makes it even easier than it already is to make homemade almond or rice milk, as it strains it for you in the metal strainer. I’ll post a photo of the SoyaBella later in case any of you should like to see it? 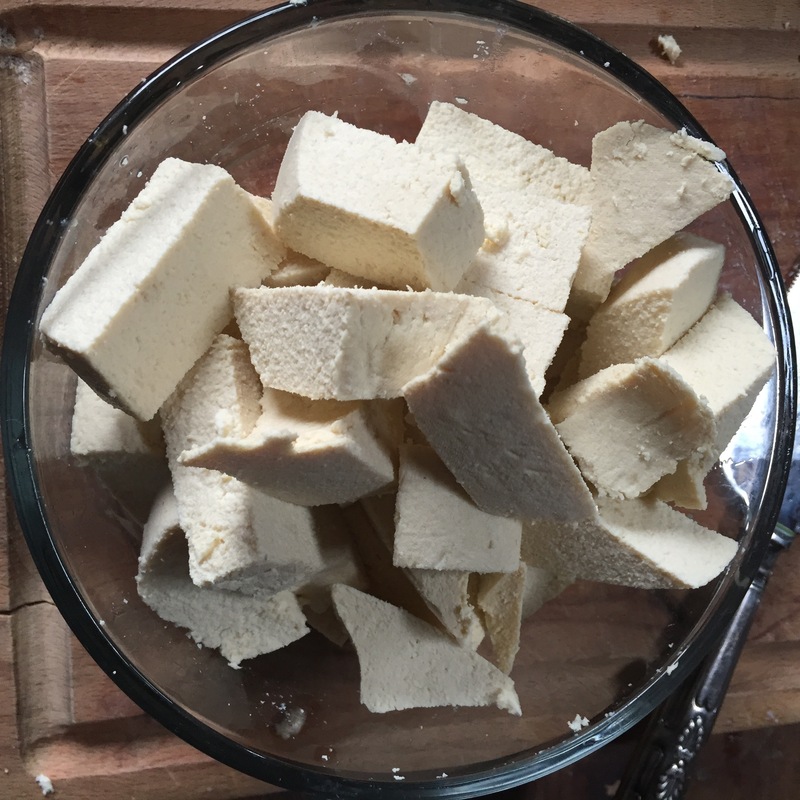 I made about 4 litres of soy milk for this batch of tofu. 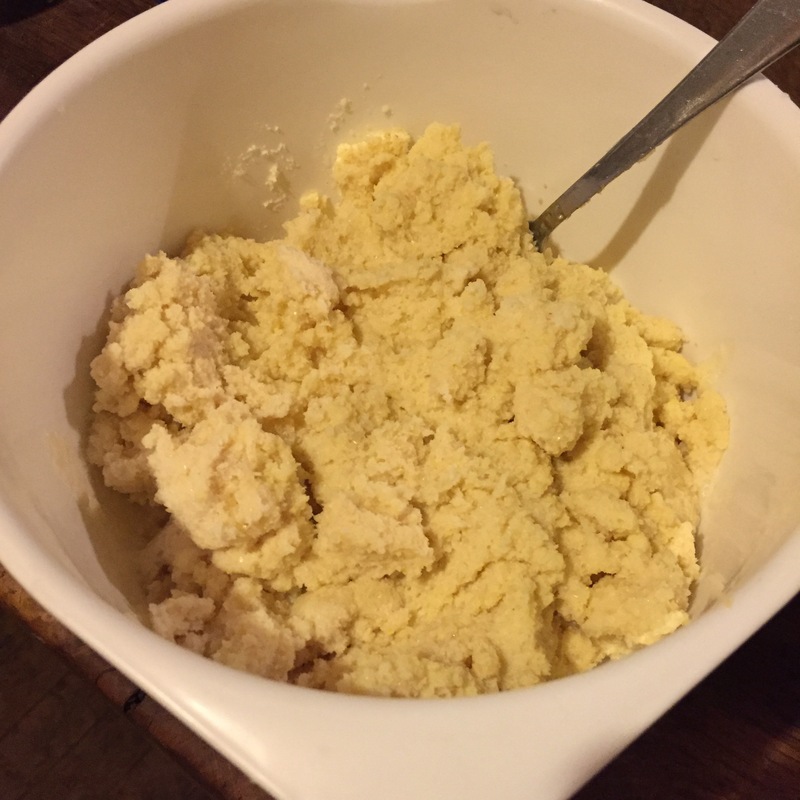 Strain out the soy bean paste, also called Okara. I put mine in the freezer to use later to make vegetarian sausages. 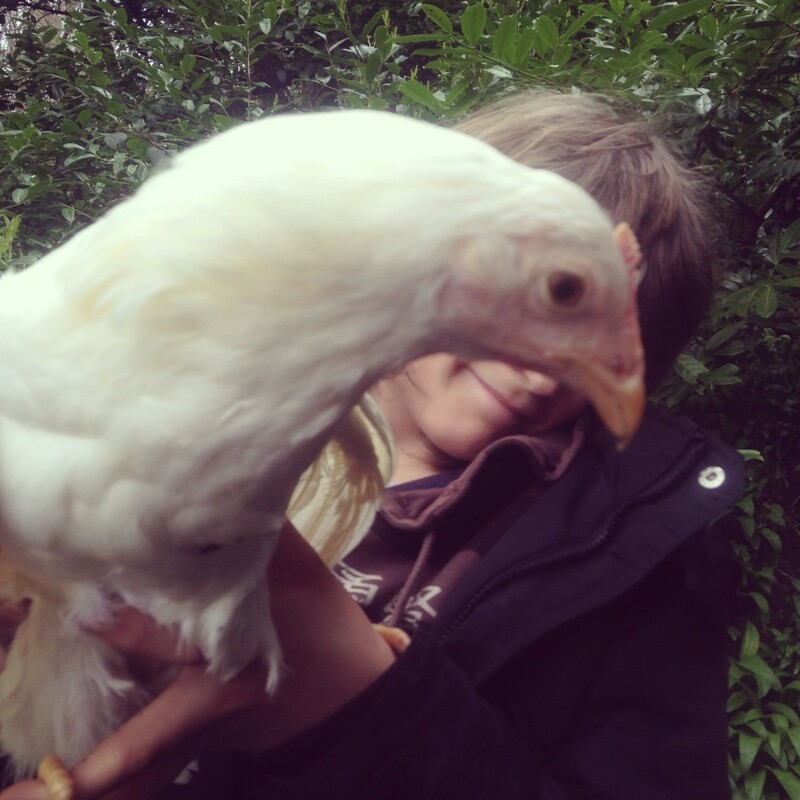 Or you can feed it to the hens. There are lots of things you can do with it if you do a quick google search. Take the soy milk and heat it up to 180F if it isn’t that hot already. 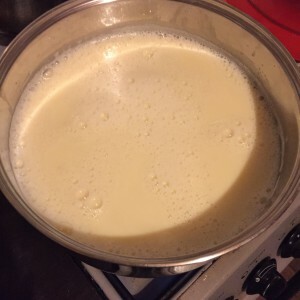 You can use a few different agents to curdle to the milk. All of these are recommended: Gypsum (Calcium Sulfate), Nigari Flakes (Magnesium Chloride). I don’t know about you but I hadn’t heard of any of these things. I read that you could also use Epsom Salts, lemon juice or apple cider vinegar- I had Epsom Salts so I used what I had. It worked perfectly. I dissolved 1 tablespoon of Epsom Salts with about a third of a cup of water. (this was added to about 4 litres of soy milk.) 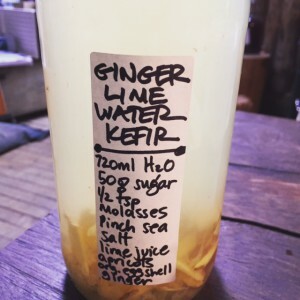 I added this into the hot soy milk in batches, first half of the glass, and one quick short stir through the milk to mix it in. Apparently over-stirring can disrupt the curd formation. 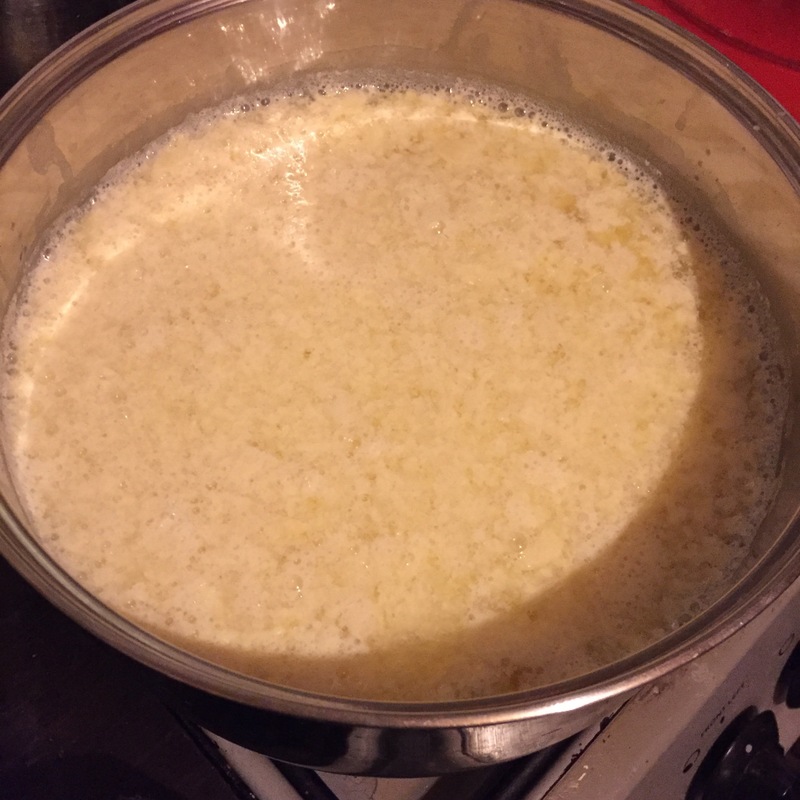 I waited 10 minutes to see if it had curdled sufficiently to see plenty of amber liquid with the formed curds separating. 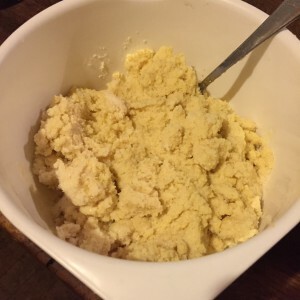 It had curdled a bit but not enough, the liquid was still quite milky white, so I added the other water-epsom salts liquid along with another quick stir. This time it finished curdling quickly and as you can see in the photo below there was plenty of largish curds with amber liquid. 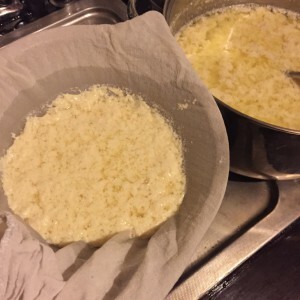 I strained the curds and whey through a sheet of muslin or cheesecloth. You can use a clean dishtowel or pillow case if thats all you have. 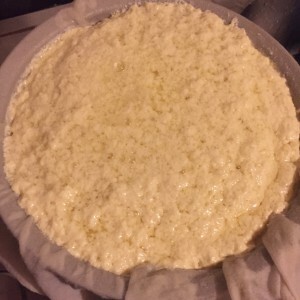 I let it sit in the strainer for about 20 minutes, then I lifted up the corners of the muslin and transferred the ball of curds in muslin to a smaller strainer. 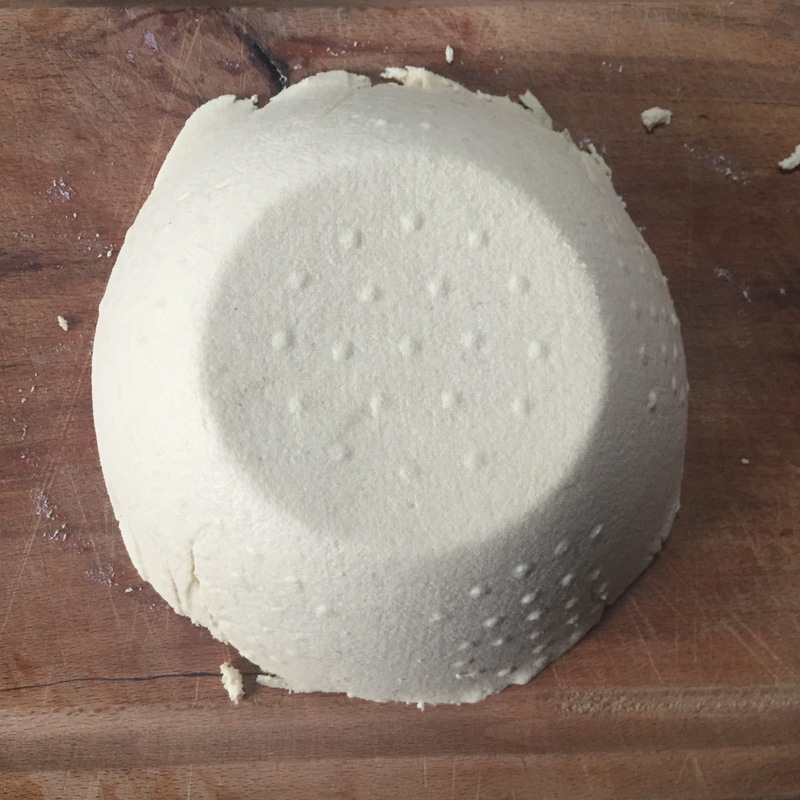 I put a small plate on top of it to press down and help it exude more whey from the curds. I added a very heavy cast iron pot on top of the plate to add further pressure. I let it sit out overnight like this. 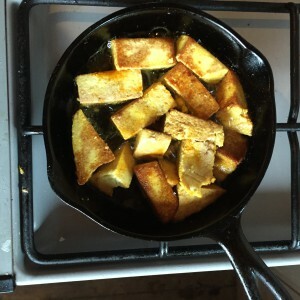 In the morning I took of the weights and turned the pressed tofu curds onto a chopping board. If you aren’t going to eat it immediately, cover it in fresh water and put in the fridge. 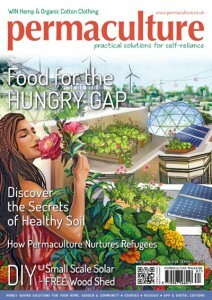 Change the water daily and eat soon. Finally I fried the tofu in some sesame oil with shoyu soy sauce and some turmeric sprinkled over it. I didn’t know tofu could be so delicious. Try it! Let me know how you get on. 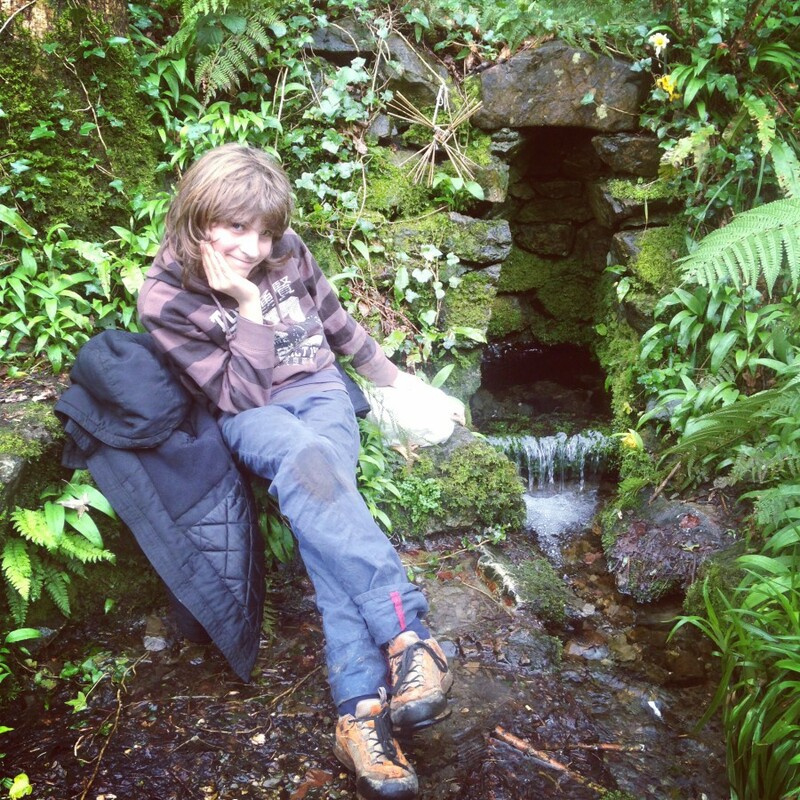 I met Miles last year in the Blackstairs Mountains at Eco Trails with Mary White at her Wild Food Summer School. 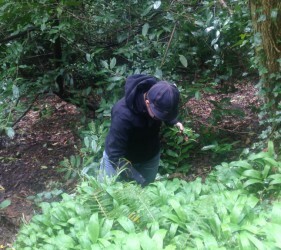 Miles took us on a very interesting foraging walk and he is one of the few I’ve met to make his living exclusively from foraging. 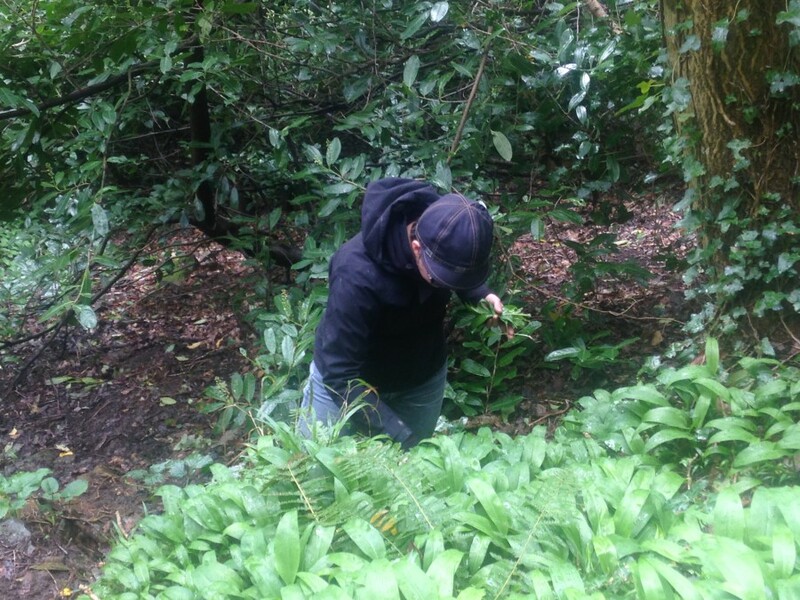 He sells his foraged wild goods to restaurants in London. 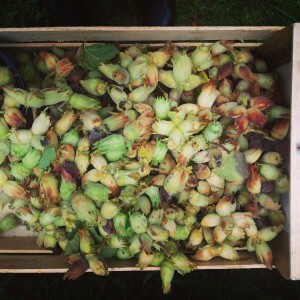 Here’s a blog post he wrote about Hazel Catkins which I found really interesting. His website can be found here. Above you’ll find an image I just shot from the hazel trees in the garden clearly showing the male hazel catkins and the tiny beautiful red female flowers that will become the nuts this autumn once pollinated. 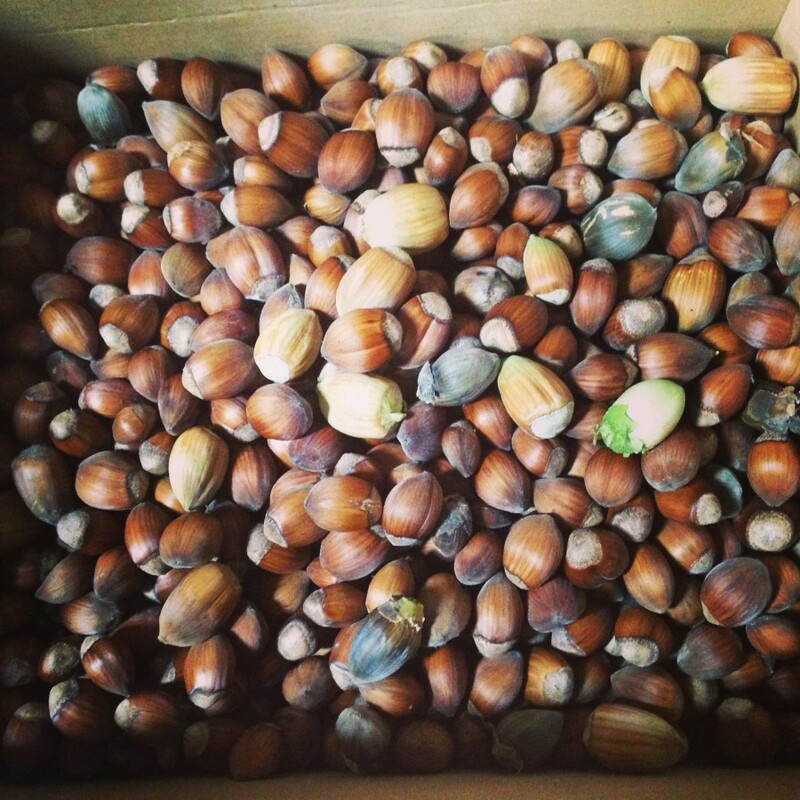 I have some photos from the huge hazelnut harvest that we got 2 years ago I’ll post here below. 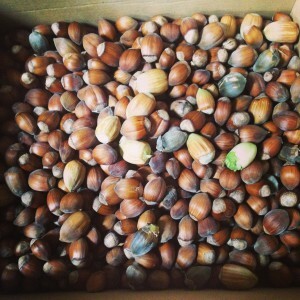 Was a lot of work husking them all and I recall there was 6 kilos of nuts! Unfortunately I didn’t dry them out properly and they got mouldy which was heartbreaking. I won’t be making that mistake again! 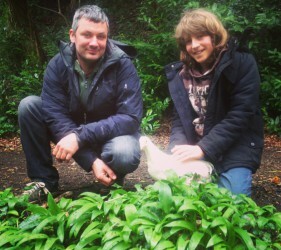 By the way I bought Miles book The Forager Handbook last year at the Wild Food event. It is an amazing resource I definitely recommend checking it out. 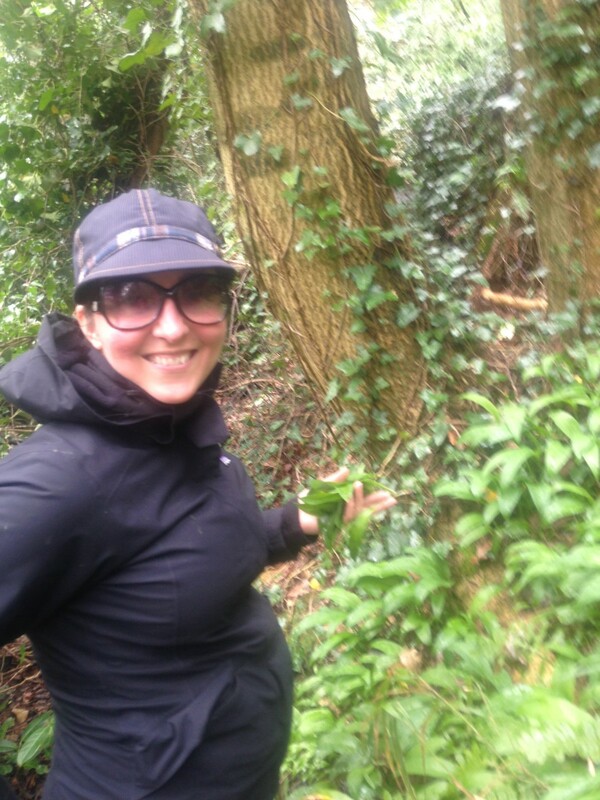 See what Eatweeds.co.uk has to say about it here. 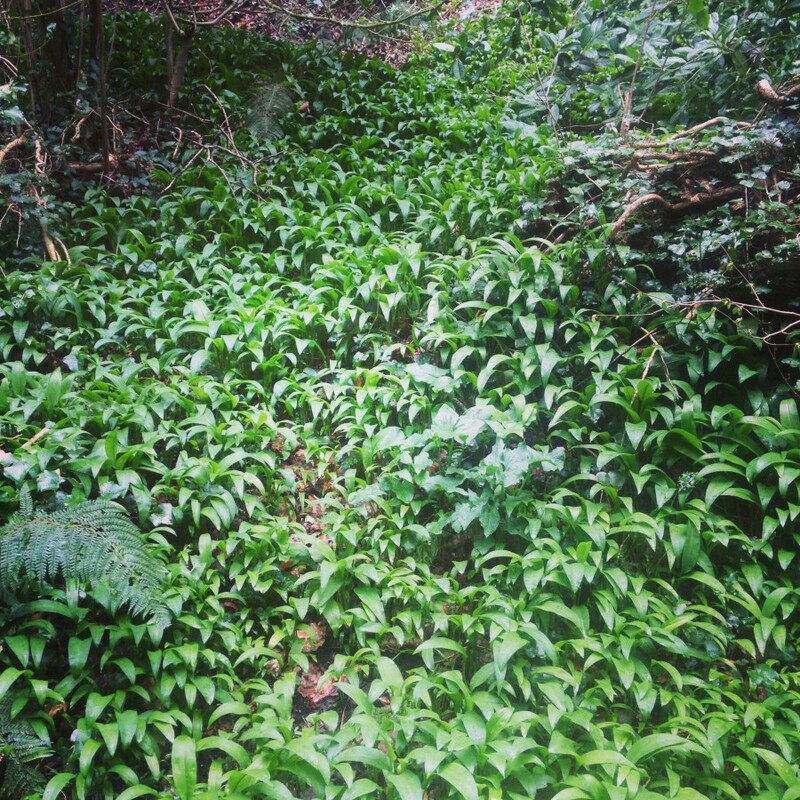 Delighted that the ramsons aka wild garlic is starting to pop up! At least they’ve started appearing in Wicklow. 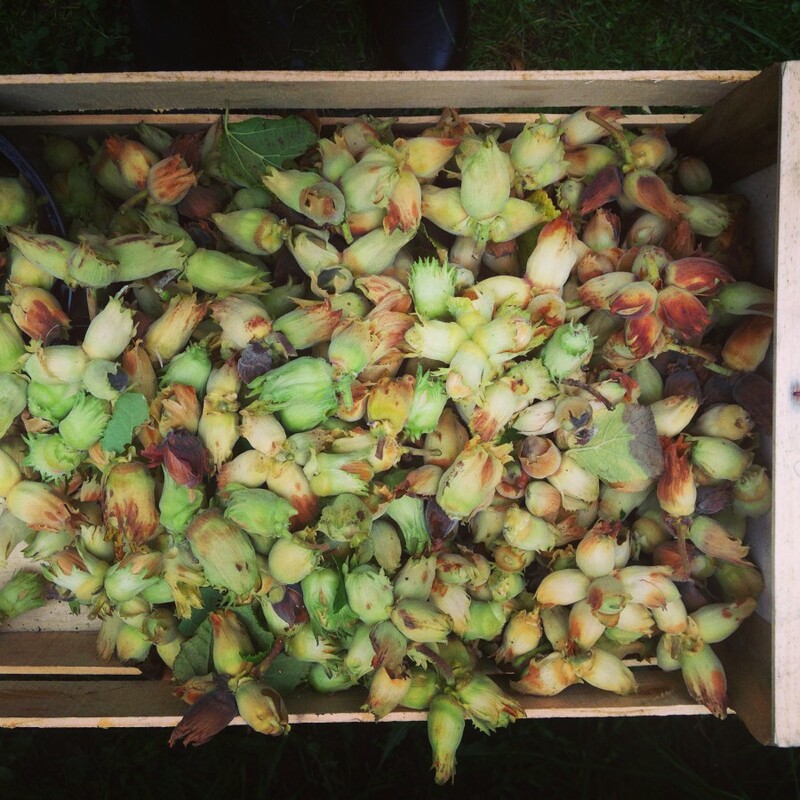 It’s always exciting to have the first wild harvest after the long winter and what a delicious one at that. 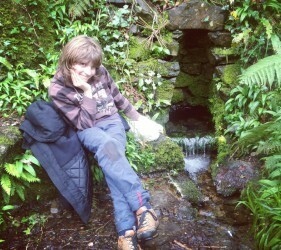 Here’s a few images from last year. 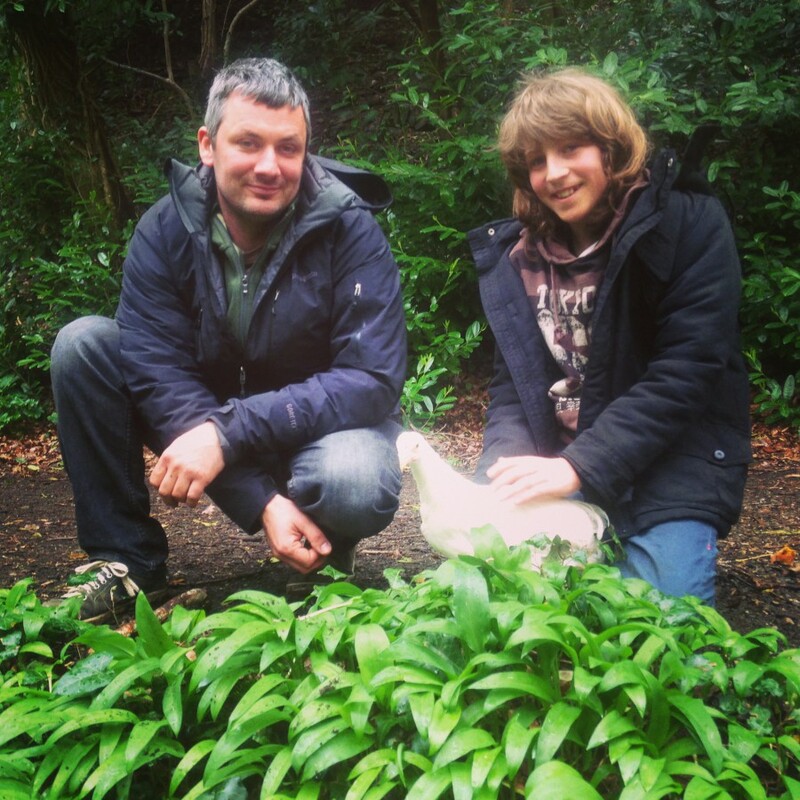 Harvesting sold wild garlic leaves, not bulbs! 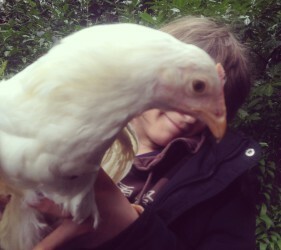 Since becoming a goat-keeper of dairy goats I’ve had the pleasure of discovering all of the ways to use goat’s milk. This recipe is the Mexican version of ‘dulce de leche’ it is pure decadence- and traditionally it uses goat’s milk instead of cow’s milk. Cajeta is a caramel made by slowly cooking and caramelizing sweetened milk. 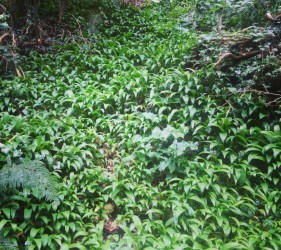 It is a common confectionary in South and Central America, especially Mexico. It’s a bit of an indulgence to say the least as it takes quite a bit of milk, sugar, fuel and time! But I think you’ll find it’s worth it. Perhaps on a rainy Sunday morning when you’ll be near the kitchen for a few hours! Start off with a quantity of goat’s milk (or cow’s milk if you prefer, or a mix!). Remember that the final product will be approximately 1/5th of what you start with. Add the milk to a heavy bottomed pot (I use an enamelled cast iron pot like Le Creuset) and turn it on to a medium heat. Keep at least 2-3 inches of space at the top of the pot in case the milk boils over. Stir regularly. Add 1 cup of brown sugar (organic and fair trade if possible) to each litre of milk and a half teaspoon of baking soda. Stir as its heating to avoid it burning on the bottom. Keep it at a steady simmer, not an angry boil or it will boil over or burn. I add vanilla extract and cinnamon to taste. Some might add rum. Keep an eye on the mixture throughout, as it can easily boil over if left unattended. You may need to occasionally remove the pan from the heat to prevent the cajeta mixture from foaming over the sides of the pan. After hours you can see how much the mixture has reduced and the more it reduces the more the simmer will increase even if you maintain it in the same level of heat, so you have to moderate and reduce the heat. You know the Cajeta is ready when: It achieves a caramel brown color; it is thick as liquid caramel or syrup; it envelops the back of the spoon; when you gently stir across the pot with your wooden spoon, a slightly delayed trail behind the spoon appears, revealing the bottom of the pot if only for a few seconds; as you slowly lift up the wooden spoon or spatula, Cajeta takes it’s time to drop and lastly, the sides of the pot show how the Cajeta has cooked down and if you run your spoon across that side, you get a fudgy (and delicious) residue. When the mixture coats the back of a spoon, its ready. Bottle it up immediately hot into warm sterilised jam jars (I use small ones as its so rich) turn it upside down to create a vacuum seal. Let it cool, and take note that it will thicken as it cools. Cajeta is not only decadent and luxurious, it is also ideal for using with… everything! crepes, pancakes, ice cream, yogurt, to dip fruit in, (try with strawberries) or even just smeared on a slice of toast. I’ve even added a spoonful to a coffee to be used like sweetened condensed milk or like a caramel latte. You can make tiny banoffee pies by covering a graham cracker or digestive biscuit in caramel and topping with freshly cut banana rounds. I top it off with some thickly strained goats greek yogurt. Amazing! The best way of all: just dip a big teaspoon and lick straight from the spoon!